Gianvito Rossi's designs can often be seen gracing the runway at the prestigious Milan Fashion Week and has enchanted women around the world with its stylish and original lines of footwear. Offering you a trend-led style straight off the catwalk, Gianvito Rossi pumps present a selection of lace-up and slip-on courts along with pointed and peep-toe designs. The collection combines traditional Italian manufacturing techniques with an array of contrasting materials such as leather, PVC, velvet, lace and metallic finishes to produce a unique and unmatchable style. 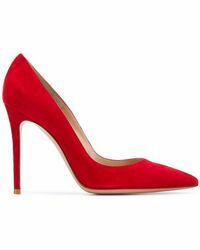 Gianvito Rossi pumps include either a thin stiletto or chunky square heel and make for a fine addition to your work and weekend closet.